Posted in Cookies, on July 12th, 2008. 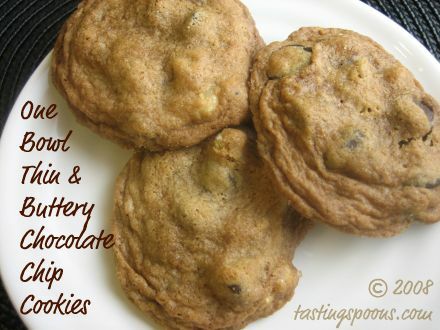 You’ve heard it here before – I have a very hard time passing up any chocolate chip cookie recipe. Good old Tollhouse is still my fav, but occasionally I’m tempted by another. Fickle cookie person that I am! What made this one unique was cornstarch. I know, cornstarch in a cookie? As I was reading Anna’s blog, Cookie Madness (I don’t know HOW that girl makes so many cookies, sometimes 2-3 batches a DAY! ), she was talking about her very favorite CC cookie recipe, from Wellesley. She elaborated that they’re not the best-est looking cookie in the parade, but they’re thin, buttery and crispy, if you bake them right. She also mentioned that there’s a very fine line between looking done, and being just right – with crispy edges – and being overdone. That’s the secret. All RIGHT, I thought. Let’s give this a try. Anna talked about the difficulty with her perfect recipe, of baking these so they come out at the perfect stage, so she decided to add one tablespoon of cornstarch. Hoping to encourage the crisp edges, but deter the overdone cookie. I’m never sure about adding either more liquid (like a dash of coffee, for instance) or dry stuff, just because it could change the chemistry of a cookie, big time. I’m glad she tried the combination. It works! In this case I did add some walnuts. If you’re a CC cookie purist, then you’ll omit those, I guess. These cookies were easy as pie to mix up. Oh, that phrase is a misnomer. Pie isn’t easy, according to me. But you get my drift. One bowl? Yes. Thin? Yes. Buttery? Oh yes. Delicious. Oh my yes. I think my first batch got overdone – I saw what she meant about the fine line. I baked these one pan at a time as Anna suggested . . . I used a Silpat on the cookie sheet . . . and when I peeked at the cookies at 10 minutes, they didn’t show any sign of crispy (browner) edges, so I left them in for ONE MORE MINUTE. At 11 minutes they were too done. Oh, dear! So, the next pan I cut down the time by 30 seconds. Still too done. Maybe the 10 minutes was right. But, you do have to remember, that once the pan is hot, when you put in the second batch, they’ll take less time. So I still have a bit of learning to do with this recipe. But it doesn’t matter once you taste them! When I removed them from the oven, believe it or not, you could actually see light through some of the cookies, they’re that thin. Notice in the picture that the top cookie almost looks slumped. My husband looked at them and said “what’s wrong with those cookies?” Hah. Funny guy. If you like soft crumbly cookies, this recipe is NOT for you. But if, like me, you love crispy crunchy cookies, these guys will float your boat. And also providing you don’t mind eating or serving some ugly ducklings! My one time fling may turn into an affair. We’ll have to see. Thank you, Anna, for sharing this wonderful recipe with us. 1. Preheat oven to 375 degrees F (190 C) and have ready an ungreased cookie sheet – preferably one that is not insulated (I used a Silpat). 2. Beat the butter, both types sugars, and vanilla together in a medium bowl, using an electric mixer. When creamy, beat in the egg. When egg is well blended, add salt and baking soda and beat well, scraping sides of bowl once or twice and making sure baking soda is well distributed throughout batter. Add cornstarch and stir until blended. Add flour and stir (do not beat) until it is almost blended in. Add the chocolate chips (and nuts if you use them) and stir until all flour disappears. 3. Drop dough by rounded teaspoonfuls onto the ungreased cookie sheets. Bake one sheet at a time on center rack for 8-10 minutes or until edges are golden brown. The cookies should get very brown around the edges, but do take care not to burn the bottoms. Per Serving: 184 Calories; 11g Fat (51.1% calories from fat); 2g Protein; 21g Carbohydrate; 1g Dietary Fiber; 21mg Cholesterol; 84mg Sodium. I’m glad you liked the cookies. Also, yours look gorgeous! Maybe it’s the way you arranged them in the photo, but I think they look delicious. As for burning and crispness issues, I like cooking mine on a non-insulated cookie sheet because I like the crispness even if it means I need to be diligent in checking the time. However, an insulated cookie sheet might work almost as well and would definitely prevent browning on the bottom. So I might go ahead and test some on an insulated sheet too. Maybe the secret would be using parchment paper. The Silpat may act as an insulator, but the parchment might be better. I’ll have to try that next time instead. I’m still loving these cookies – they are the most crisp cookie I’ve ever eaten, and the taste is just superb. Thanks for all your hard work putting your excellent blog together.